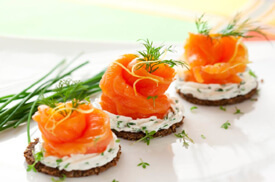 For this class, I will inspire you to create beautiful canapés for the holidays or a dinner party. First up will be a smoked salmon canapé on pumpernickel bread and followed by poached and fried quail eggs topped with candied bacon. Bon appétit! This class also includes a recipe for French Macaroons with Butter Cream!